Two unforgettable canines share hardship and adventure in this new children’s book released by Dog Ear Publishing. When stray dog Jethro sees an unfamiliar dog smelling of sadness at Glenwood Memorial Cemetery, little does he know his life is going to change – for the better. It seems Fritz, a German shepherd who also stars in this new children’s book, has an adventurous past, including doing a tour in Iraq as a soldier dog. The magic of friendship is apparent in this charming story. Surviving a hurricane is just the first of the new adventures the two dogs share. 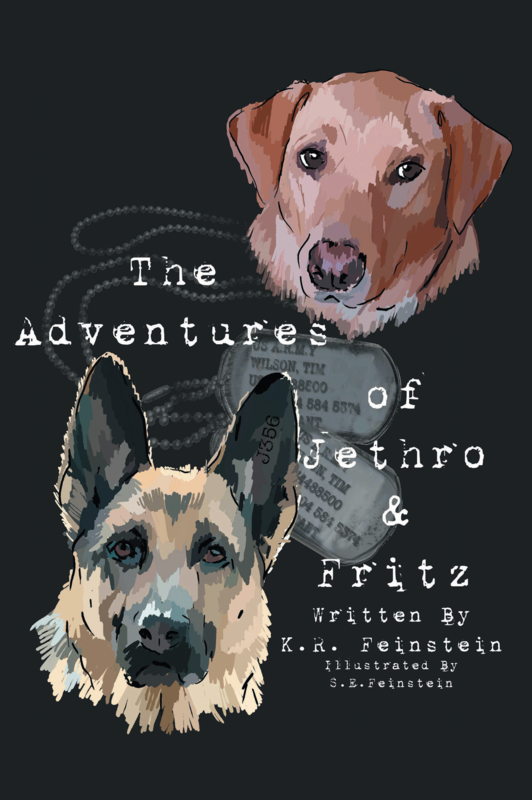 “The Adventures of Jethro & Fritz” slowly reveals Fritz’s past, from his beginnings as the runt of the litter to Army training to the tragic consequences of war. Jethro, not a typically adventurous character, soon finds himself taking part in situations that he would never dare tackle alone, including a brush with animal control. By working together, Jethro and Fritz uncover dangerous dealings in town and learn that despite their different backgrounds, each has his own style of courage. Pen and ink illustrations by S.E. Feinstein enhance the start of each chapter in this heartwarming book that introduces children to war, as well as courageous trainers and dogs who help keep troops safe. For additional information, please visit www.theadventuresofjethroandfritz.com. 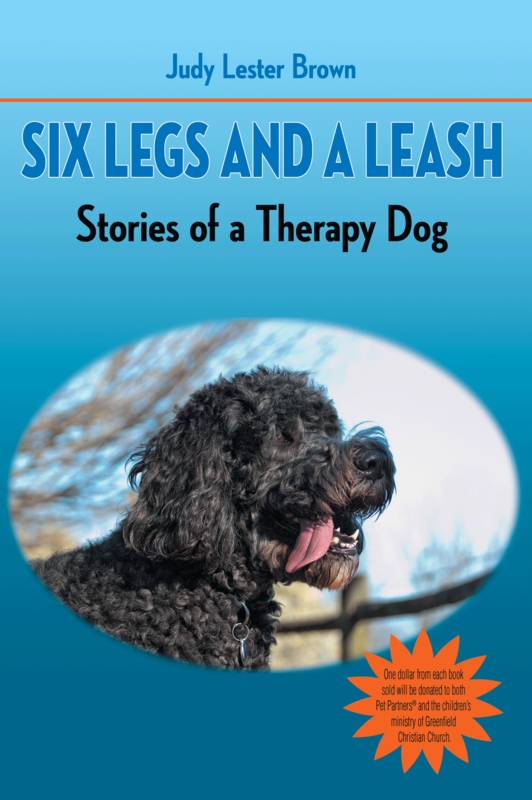 Dog Ear Publishing releases “Six Legs and a Leash: Stories of a Therapy Dog” by Judy Lester Brown. A retired bank executive and an affectionate, mischievous giant schnoodle team up to become an effective tool for healing and ministry in their community. Judy Lester Brown describes their journey and mission, as well as that of other therapy dogs in this new book released by Dog Ear Publishing. When Judy Lester Brown first saw the giant schnoodle, it was love at first sight. Reggie, who proves to be funny, intelligent, exuberant – and stubborn – and Judy soon begin an intense two-year training session to become certified as a team for animal assisted activities and animal assisted therapy. This new book chronicles their story, describing their work visiting hospital patients, nursing home residents and people with special needs. Reggie and Judy even learn to communicate Bible truths to children, illustrating messages with Reggie at the center, at Greenfield Christian Church – where Judy first began to consider pet therapy as a ministry. “Six Legs and a Leash: Stories of a Therapy Dog” shows the tremendous dedication Judy brings to working with Reggie, who eventually passed testing and became registered by Pet Partners. 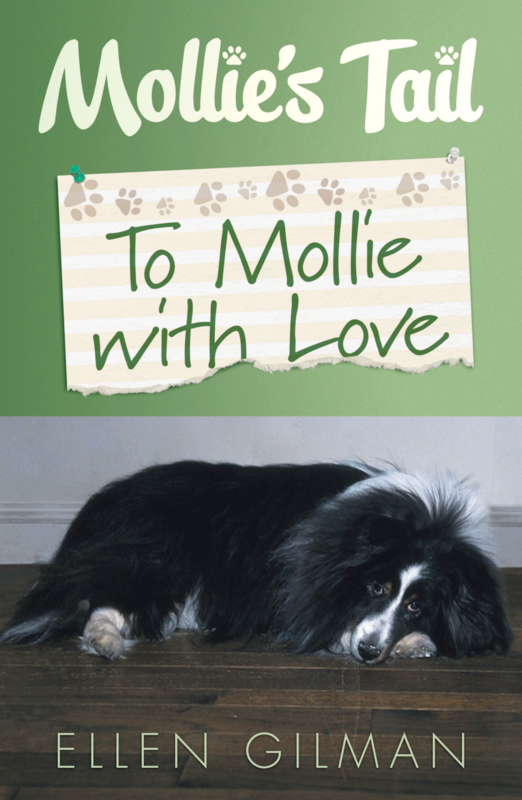 In the first section, she details how they manage to coax nursing home patients to stroke Reggie’s fur or throw a ball for him, leading to smiles and anticipation for his next visit. Each vignette shows how much the patients, families and caregivers appreciate the friendly dog’s work. The book’s second section highlights a series of children’s sermons and lessons Judy presents with Reggie’s help. Topics include the importance of being kind to one another, saying thank you, choosing a good attitude and what it means to follow Jesus. The books’ third section features stories of other people and their work with therapy dogs: a college freshman with cerebral palsy whose dog helps him be more independent; Judy’s mentor and trainer Jamie Young, a veterinary pathologist who breeds and trains assistance dogs, including Reggie; and an amputee and cancer survivor who adopts a loving stray dog. This heartwarming book tells the tale of one woman’s determination to help others with her canine partner. Judy’s commitment to following God’s dictate to love one another is clear; she will donate $1 from the sale of each book to both Pet Partners and the children’s ministry of Greenfield Christian Church. This is the first book for author Judy Lester Brown, who majored in journalism at the University of Kentucky. Brown, who worked as a feature writer for two daily newspapers and as vice president of marketing for Greenfield Banking Company, has published articles in several magazines as a freelance writer. Dog Ear Publishing releases “Tyler the Cowpoke” by Joseph Louis Garces III. A young cowboy finds his lasso comes in handy when danger threatens a cattle drive in this new children’s book released by Dog Ear Publishing. A young cowpoke takes to the trail with his loyal dog and trusty horse Lightning, helping with a cattle drive. But the drive has its dangers, and when wolves decide to attack, can Tyler protect the herd? This new illustrated children’s book set in the West presents an adventure appropriate for reading again and again. 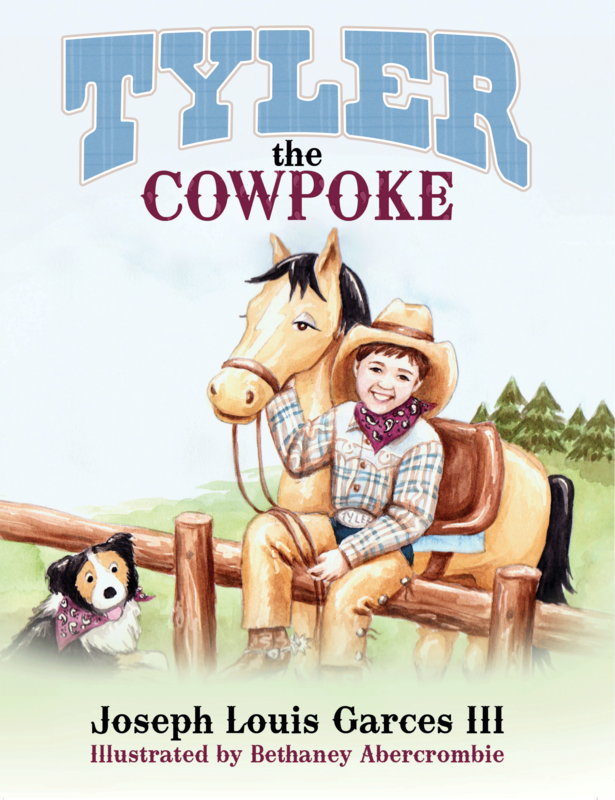 “Tyler the Cowpoke” describes Tyler’s life, spent in a cabin and caring for his family’s cattle. When he puts on his boots, silver spurs, chaps, an old cowboy hat and a bandana, he’s ready to drive cattle and round up strays. Another of Tyler’s tools – his lasso – comes in handy during the cattle drive. The adventure, told in rhymes, is appropriate for independent reading and read-aloud fun. Bethaney Abercrombie’s whimsical watercolor illustrations bring the story to life. This is the second book for author Joseph Garces III, who wrote it for his second son, Tyler. His first book was “Garrett the Firefighter.” Garces, a firefighter for the City of Oxnard, is a former elementary teacher with a degree in elementary education from Southern Utah University. He and his wife, Taira, have three boys. Illustrator Bethaney Abercrombie, a former art educator, has art education degrees from Brigham Young University and Northern Arizona University. She lives in Gilbert, Ariz., and has four children. For additional information, please visit www.Tylerthecowpoke.com.